The Transportation Options Team is excited to offer FREE commute-planning services to help find the best commute for you. A Transportation Options Team member will fulfill your request within 5 business days. 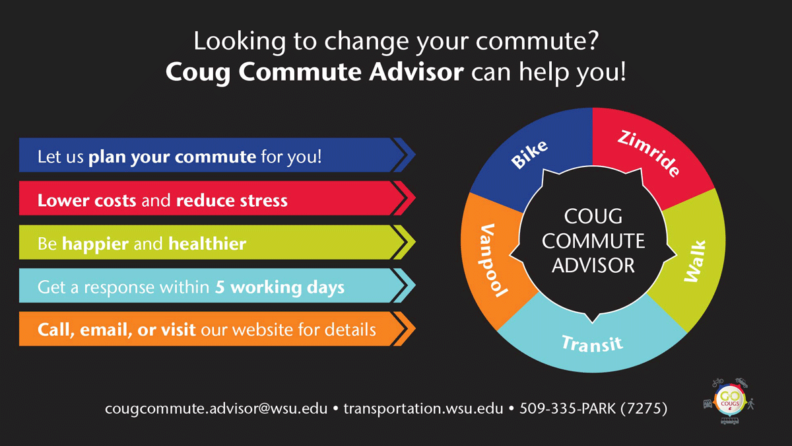 For immediate assistance, give us an email at cougcommute.advisor@wsu.edu or call at 509-335-PARK (7275) or visit the Transportation Services office. Nervous about returning your parking permit to try a new commute? In the case you find that your new commute just isn’t going to work for you, and you’ve already returned your parking permit to Transportation Services, no worries! We will make sure you get your same permit back.